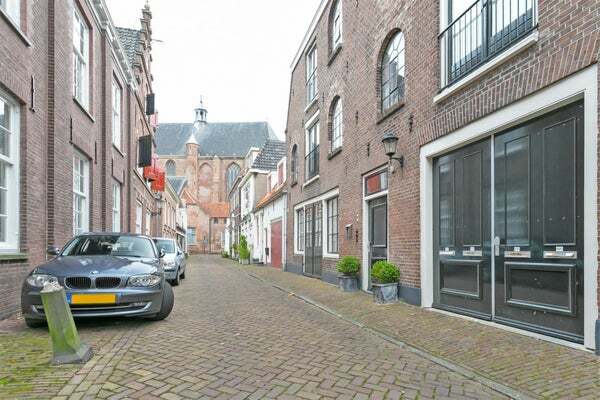 Spacious 4-room apartment on the 2nd floor in characteristic warehouse in the heart of the cozy fortified town of Weesp. The apartment is located in a motorway of Weesp within walking distance of the railway station (from which Amsterdam CS is only 17 minutes away and Schiphol airport is only 22 minutes away). In the immediate vicinity are the "De Vecht" river, schools, sports facilities, children's (day) reception and roads to Amsterdam, AMC, Schiphol Airport, Hilversum and Utrecht. Layout: Entrance hall, toilet, living room with open kitchen, dishwasher, oven, 4 burner gas hob, extractor hood, dishwasher, fridge / freezer, built-in balcony, room, bedroom, spacious bathroom with double sink, bath and shower, 2nd bedroom .